Bahrain concedes a corner…Kiwi strikers and midfielders position themselves in the enemy box as Bahraini defenders try and block them…Bertos crosses the ball in, Rory Fallon jumps…and scores!!! The above narration tells the story of New Zealand’s historic qualifying play-off win over Bahrain in their own home ground. The All Whites, as they are fondly called, qualified to only their second FIFA World Cup and the last one was more than two decades ago. Kiwis in attendance took their shirts off in jubilation, despite the cold Wellington breeze. Their roars signaled the start of what was to be a dream World Cup run. A nation dominated by rugby popularity, being home to the world famous All Blacks, football was only New Zealand’s secondary sport. However, as news of the All Whites’ achievement made headlines, rugby balls turned into footballs and the youths here were focused on scoring goals instead of tries. The All Whites are a well-assembled team, managed by Ricki Herbert, an ex-All White himself, and is captained by Blackburn Rovers F.C. skipper Ryan Nelsen. Also in the team are strikers Chris Killen and Rory Fallon of Middlesbrough F.C. and Plymouth Argyle respectively. The young striker of West Bromwich Albion, Chris Wood and eight players from local Oceania league Hyundai A-League which includes their goalkeeper, Mark Paston. The previous World Cup campaign of the All Whites saw them being pitted into the same group as Brazil, the Soviet Union and Scotland. A difficult seeding had the team finish their campaign bottom of the group with no points. Future matches would see them experience tough defeats to Oceanic rivals Australia and upsets courtesy of Vanuatu and the Fiji Islands. Time would see the All Whites fall in global football ranking, plunging down to 156 in 2007. The win against Bahrain, and ultimately the trip to South Africa saw many Kiwis hope that it would be the turn of their footballing fortunes. And it indeed it was. The run-up to the World Cup finals in Johannesburg saw the All Whites beat a more organized team in Serbia, 1-0 in the latter’s own soil. In the friendly game prior to that, the Kiwis faced their Oceanic neighbors Australia. The All Whites went ahead early in the match thanks to Chris Killen, but two late strikes including one that came from Brett Holman sealed an Aussie victory. The friendlies after Serbia were disappointing to the Kiwis as well, a 3-1 defeat to Slovenia and a 2-0 loss to Chile. The latter being the last friendly match prior to the World Cup finals. 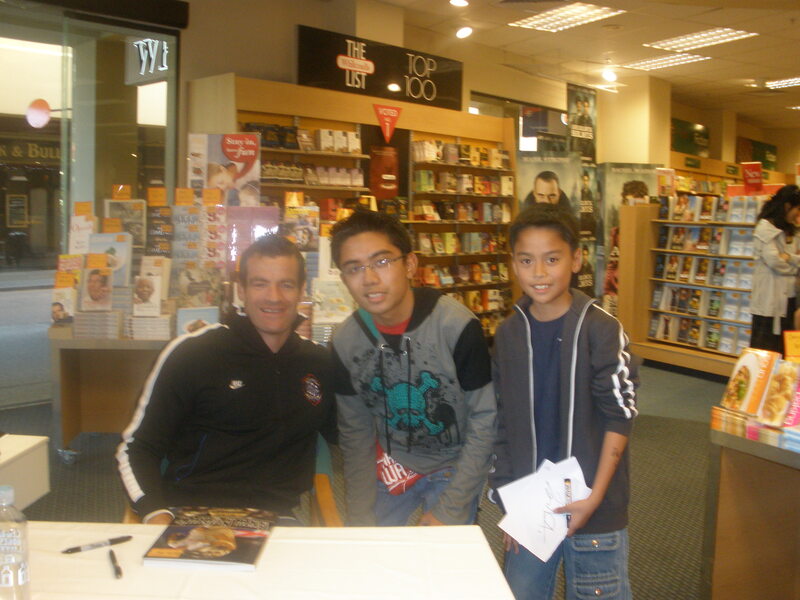 My brother and I meeting All Whites skipper Ryan Nelsen at a book signing affair. New Zealand were pit in a group consisting of Slovakia, Paraguay and defending champions Italy. Their first game was held at Rustenburg, the same stadium USA pulled a surprise result against England. The site where Robert Green’s infamous blunder took place. Their first opponents were Slovakia, the second lowest ranked team in their group (after themselves of course). The All Whites went into this match as underdogs, but despite that they were able to pull a 1-1 draw against the Slovaks. Their second game, against the reigning World Champions, Italy was one bookmakers considered to be a mismatch. The technique, experience and skill of the Italians were too much for the lowly Kiwis, they thought. But Chris Killen put his team ahead in just the seventh minute, until Daniele de Rossi controversially went down to a Tommy Smith challenge and resulted in Vincenzo Iaquinta scoring from a spot kick. New Zealand may have picked up a result less than what they had hoped for (or the one they should’ve had), but its one they were willing to cherish as the toughest obstacle in their pool had been taken care of. And so, after that match the scenario was that the All Whites only needed to match or better the result of Italy and Slovakia in their next game against Paraguay. However, they wouldn’t be so lucky in their next game. Despite a draw against a much experienced Paraguayan side, a win for Slovakia against Italy meant that they would advance to the next round as runner-ups, edging New Zealand by a single point. The All Whites may have exited the World Cup, but unlike the French or the Italians who were booed by their own countrymen, the Kiwis welcomed their national team with pride. They proved critics wrong, as they showed that they weren’t as easy as they thought they would be.